Allow new users to request access directly on the login page. This is how you configure the request access. The more users you have accessing your brand portal the more you have to deal with user management. Single-Sign-On is a great way to automate access for colleagues within your organization but fails to handle access requests from your external partners. Enabling the Request Access feature takes off some of the emailing headache necessary for every such request. New users can request access themselves directly on the login page and fill in a form with essential information for you to grant or deny access. You’re able to define which kind of information is important for deciding on an access grant or denial. Simply configure your access request settings by clicking on your profile picture in-app (bottom left) > “Configure your Access Request”. There you have the possibility to add, and remove fields - just as you wish. Once the new user has sent the form, all relevant information will be delivered to your E-Mail for further actions. 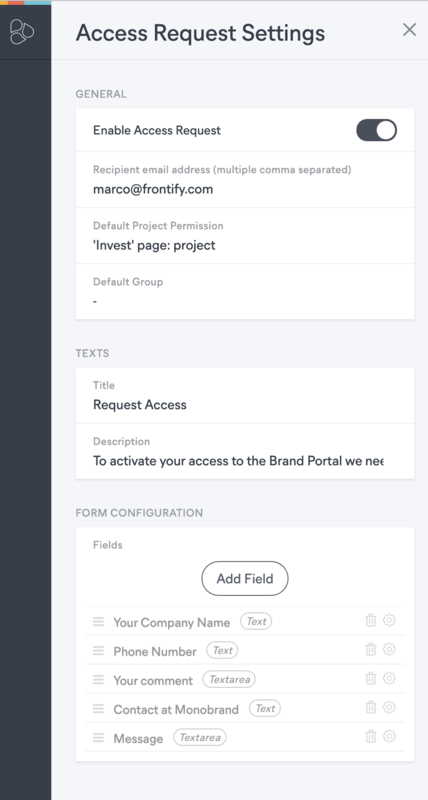 Request Access is an Enterprise plan feature. Please contact your account responsible at Frontify to activate it for you.